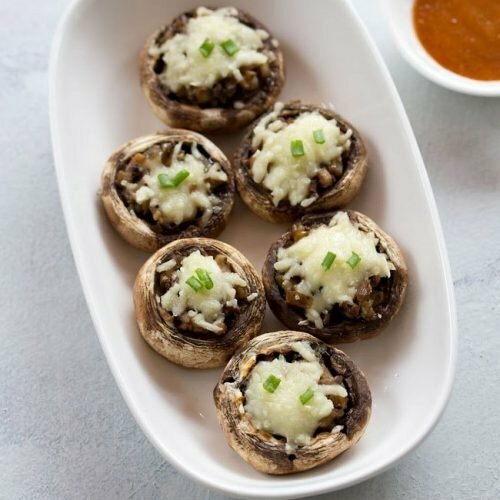 baked stuffed mushrooms recipe - easy recipe of baked stuffed mushrooms. first rinse and wipe dry 400 grams white button mushrooms. slice off a bit of the muddy part of the stalks and discard them. then just break stalk from each of the mushrooms. keep the stalks as well as the mushroom caps aside. chop off all the stalks finely. heat 1/2 to 1 tablespoon olive oil in a pan. add 1 teaspoon finely chopped garlic. saute the garlic for some seconds on a low flame. no need to brown them. begin to saute the onions on a low to medium flame, till they become light golden or golden. now add the finely chopped mushroom stalks. mix very well and saute on a medium flame. the mushrooms would first release some moisture or water. saute till the mushroom mixture is dried and there is no water or moisture. then add 1/2 to 3/4 teaspoon crushed black pepper, 1/2 teaspoon dried basil and 1/4 teaspoon dried oregano. you can also use your choice of dried herbs or add fresh herbs. mix very well and switch off the flame. let the mushroom stuffing become warm or cool down. taste and if required add more herbs, black pepper or salt. now with a small spoon place the stuffing in each mushroom cap. before you begin stuffing the mushroom caps, preheat your oven at 180 degrees celsius for 15 to 20 minutes. top up with some grated cheese. you can use processed cheese, cheddar cheese or mozzarella cheese. grease a baking tray with some olive oil. you can also use butter instead of olive oil for greasing the baking tray. place the stuffed mushroom caps on a baking tray. keep the baking tray in the preheated oven. bake for 180 degrees celsius for 15 to 20 minutes. you need to bake till the mushrooms shrink a bit in size and water starts releasing from them. the cheese will also melt and the color of the mushrooms will darken. allow to cool for a few minutes and then serve stuffed mushrooms hot as starter dish with any dip or chutney or sauce. do not serve after the mushrooms cool down as they become too soggy and soft. so they are best had when they are hot. you can garnish with some spring onion greens or chives or fresh herbs while serving.